The situation in the combat zone remains complicated. Military clashes repeated last week. Military clashes in Luhansk region. On July 25, a brief firefight took place near Trokhizbenka. A group of enemy reconnoiters tried to approach Ukrainian positions but were timely spotted. Ten minutes later, the enemy retreated. 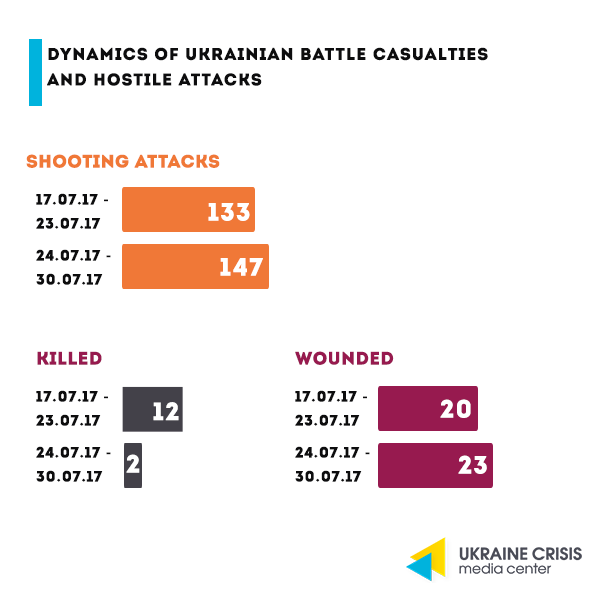 On July 26, a serious firefight between Ukrainian troops and illegal armed groups took place near Katerynivka. Ukrainian soldiers were forced to use armored vehicles. Armed confrontation continues on the Bakhmut road. On July 28, militants opened fire at the Ukrainian positions in Novotoshkivske. Then militants’ sabotage-reconnaissance group consisting of up to 10 people advanced towards the Ukrainian base. Ukrainian soldier’s coordinated actions made the enemy retreat 15 minutes later. New evidence of Russian aggression in Donbas. During the engagement near Novotoshkivske, separatists left a light anti-tank grenade launcher RPG-7V, a Kalashnikov machine gun, and an analog radio station Motorola on the battlefield. The information was provided by the ATO Press Center. OSCE. According to the Ukrainian intelligence, militants are going to commit a series of terrorist attacks against the OSCE representatives in Donbas in order to hold the Ukrainian army responsible for this. Normandy format talks: results. The website of the German government reports on the results of the Normandy format talks. They focus on the need to restart economic relations between Ukraine and the occupied territories. Diplomatic negotiations: the US. United States Special Representative for Ukraine Negotiations Kurt Volker announced his intention to talk with Russia’s representatives in the Minsk process, noting that that was going to be a “conversation of strategic importance”. In his opinion, it is most important to discuss the issue of security in the uncontrolled part of Donbas with Moscow. The State Department of the United States said that they did not consider the issue of providing defensive weapons to Ukraine, but Washington does not rule out this possibility. This was stated by the State Department Spokesperson Heather Nauert, in answer to the question whether Washington was already considering the issue of providing defensive weapons. 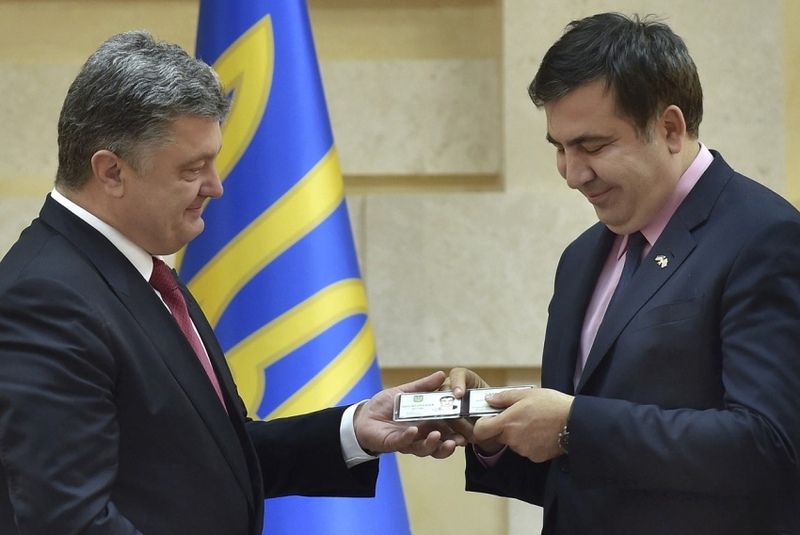 On July 27, President Poroshenko withdrew Saakashvili’s Ukrainian passport. The next day Saakashvili gave an exclusive interview to the Ukrayinska Pravda, where he explained why, in his opinion, the President had taken away his passport. Here are the main theses of the conversation. On July 29, judge of the Court of Appeal of the Luhansk Region Vitalіy Rudenko returned from captivity of the militants of the self-proclaimed Luhansk People’s Republic to the Ukrainian government-controlled territory. Rudenko was illegally held in detention and tortured at the Ministry of the State Security of “LPR” for nine months. 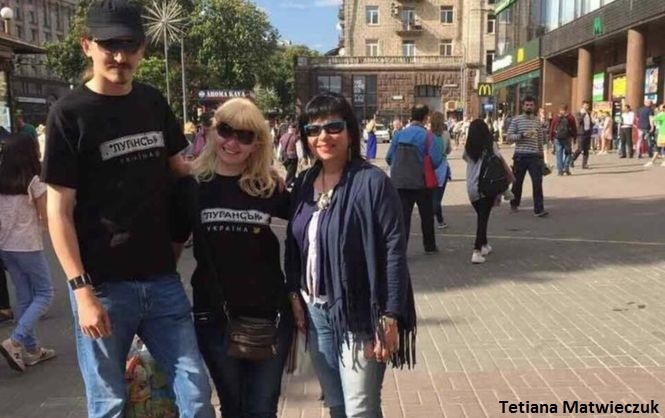 On the same day, one more hostage was released – Liudmyla Surzhenko, a blogger from Luhansk. Surzhenko is a person with a childhood hearing disability. On July 13, the militants arrested her because she did not obey their order when crossing the boundary line towards the occupied territories. In fact, she did not hear the order because at that time the batteries in her hearing aids were run down. In captivity, the woman was accused of espionage and put to torture. Kyiv reports that as of the beginning of July, 137 Ukrainian citizens were held captive by Russia-backed militants. They demand that Ukraine exchange 600 prisoners. Judicial reform: who will become judges in the Supreme Court of the country? The top news of the week – selecting the worthy persons to create a new, independent, honest court. The High Qualification Commission of Judges of Ukraine approved the ranking of candidates for the positions of the Supreme Court judges. One hundred and twenty persons became winners of the competition. Of 120 candidates selected by the HQCJU for the positions of judges to 4 cassation courts in the Supreme Court, 30 turned out to have the negative decision of the Public Council of Integrity. Consequently, every fourth prospective judge of the Supreme Court selected by the HQCJU, violated human rights, made politically motivated decisions, or cannot explain their private fortunes, stated in the Reanimation Package of Reforms. Now, the High Council of Justice should vote for all 120 candidates, after which the President will appoint them by his personal signature. The nationwide population survey conducted by the Ilko Kucheriv Democratic Initiatives Foundation together with the sociological service of the Razumkov Center revealed that a relative majority of Ukrainians (48%) support the idea of holding the early parliamentary elections. Voters’ sympathies are with “Batkivshchyna”. It is supported by almost 7.7% of all citizens or 11.2% of those who intend to take part in the elections. Petro Poroshenko’s “Solidarity” Bloc comes second; only 6.9% of all respondents and 9.3% of potential voters will vote for it. Ukrainian Opera-Horror “HAMLET. Dramma per Musica” will be presented at one of the largest international theater events in Europe – the Shakespeare Festival in Gdansk, Poland. It was chosen from among more than 100 performances from all over the world. On August 2, it will be shown on the main stage of the Shakespeare Theater. The authors of the Ukrainian production are director Rostyslav Derzhypilsky and composers of the NOVA OPERA formation Roman Hryhoriv and Illya Razumeyko. The opera combines jazz and rock, Roma and Serbian tunes, as well as music from the 1970s movies. 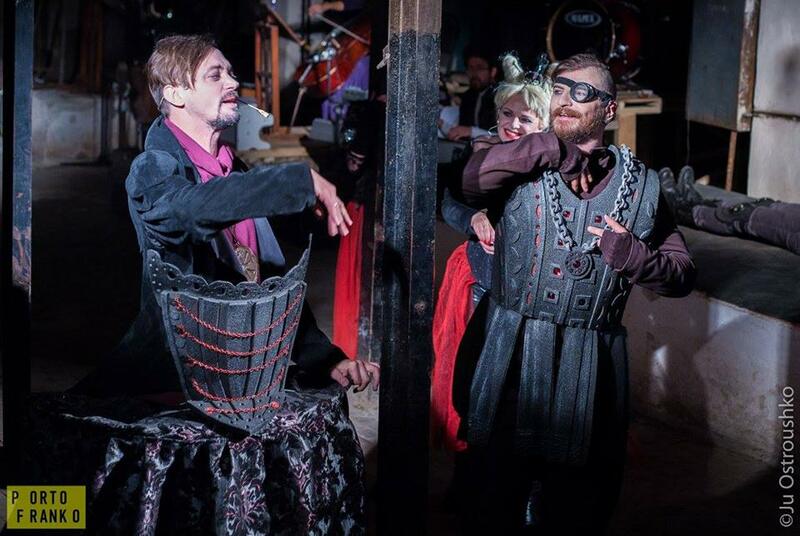 In Ukraine, the premiere of the opera was held in February in Ivano-Frankivsk, in the basement of the local drama theater. At the festival in Gdansk, the creators of “HAMLET. Dramma per Musica” will also deliver a lecture titled “Shakespeare and noise” in the framework of the educational program, in which they will talk about their work on the performance. Here’s a trailer of the performance. Ukrainian swimmer Andriy Hovorov finished third in the 50 m butterfly style finals at the World Swimming Championships in Budapest. This medal has become the first for Ukraine since the World Cup in 2007. A few days later, Mykhailo Romanchuk won another medal – a silver one. He came second in the 1,500-m free style.